Former “Sesame Street” writer Mark Saltzman said Bert and Ernie’s relationship was modeled after his own with his life partner, Arnold Glassman. Iconic "Sesame Street" puppets Bert and Ernie are a couple, according to a former writer for the show. In an exclusive interview with with blog "Queerty," Mark Saltzman said he felt that when he was writing Bert and Ernie, he was writing them as a couple and basing their interactions on his own experiences. "I always felt that without a huge agenda, when I was writing Bert and Ernie, they were," Saltzman told Queerty. "I didn’t have any other way to contextualize them. The other thing was, more than one person referred to Arnie and I as 'Bert and Ernie.'" However, Sesame Workshop, which produces the show, denies the pair are together, saying they have no sexual orientation but are best friends. “As we have always said, Bert and Ernie are best friends. They were created to teach preschoolers that people can be good friends with those who are very different from themselves. 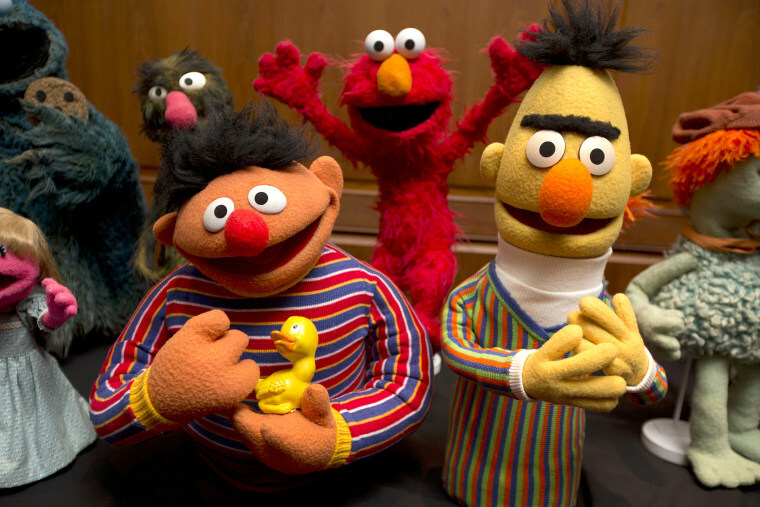 Even though they are identified as male characters and possess many human traits and characteristics (as most Sesame Street Muppets™ do), they remain puppets, and do not have a sexual orientation,” the workshop said in a statement to NBC News. Saltzman, who wrote for "Sesame Street" from 1981 until 1990, said the duo's relationship was modeled after his own life with film editor Arnold Glassman, who was Saltzman's partner until Glassman's death in 2003. "I was Ernie. I look more Bert-ish. And Arnie, as a film editor — if you thought of Bert with a job in the world, wouldn’t that be perfect? Bert with his paper clips and organization? And I was the jokester," Saltzman said. Bert and Ernie's relationship has long been questioned by droves off viewers. In 2011, a petition to have the show marry the two characters received nearly 11,000 signatures. In 2013, after the Supreme Court deemed the Defense of Marriage Act (which declared marriage solely as a legal union between a man and a woman) unconstitutional, Bert and Ernie appeared on the cover of The New Yorker cuddle up with one another watching a television showing the Supreme Court Justices. "The New Yorker cover was kind of vindication, but there’s not a Bert & Ernie float in the Pride Parade," Saltzman said.